Slightly concaved 9mm nickel plated brass disc electrodes with pin. 24" red/black PVC insulated lead wires terminate in standard touch-proof connection. Sold non-sterile. Part # Description Size Quantity Sale Price Buy Now! SlimLine design enables secure taping with no rolling of the electrode. 9mm discs are slightly concaved with 30mm spacing. 24" red/black PVC insulated twisted lead wires terminate in standard touch-proof connection. Sold non-sterile. Heavy gauge stainless steel springs with easy grip neoprene slides and heavy duty wire supports. 24" red/black PVC insulated lead wires terminate in standard touch-proof connection. Sold non-sterile. Heavy duty stainless steel finger clips. 24" red/black PVC insulated lead wires terminate in standard touch-proof connection. Sold non-sterile. Reusable ground electrodes are available in a 22mm stainless steel concave disc or a 32mm nickel plated brass flat disc. 24" or 48" PVC insulated lead wire terminates in standard touch-proof connection. Sold non-sterile. For use with all Electrodes Store and Kendall disposable surface electrodes. 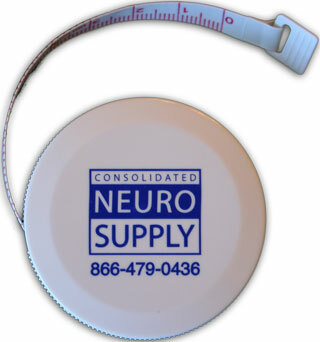 Consolidated Neuro Supply brand push button retractable tape measure comes with metric on one side, standard on the other. 60" length. ZyTemp's Infrared Thermometer provdes instant digital readout of skin surface temperature. Easy to use and takes less than one second to find skin temperature, without direct patient contact.